The Sunflower is an English Paper Piecing (EPP) project in the Farmland Series. 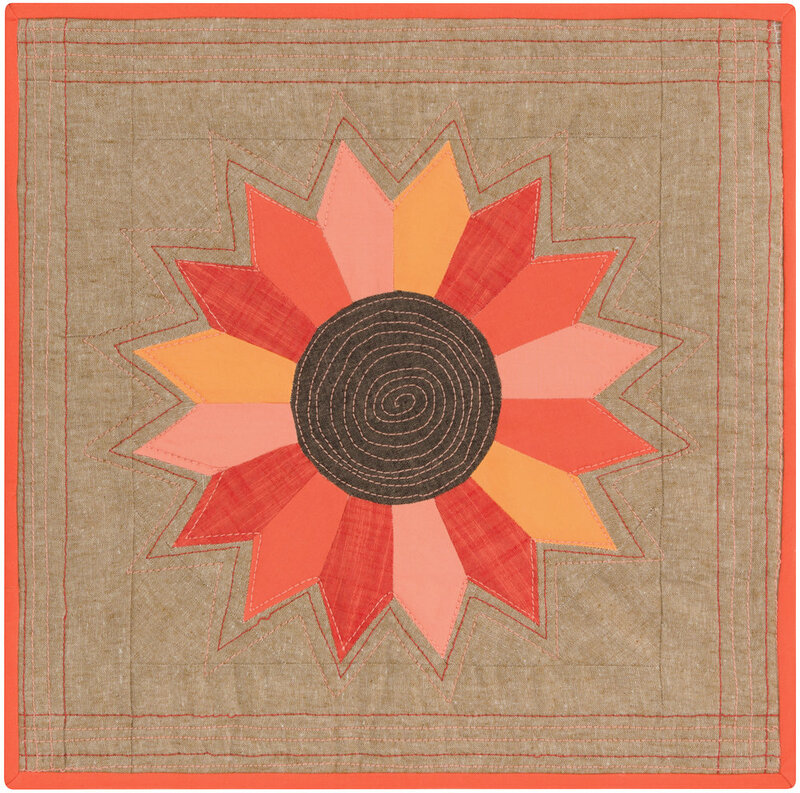 Each block finishes at 12” square: perfect for a wall hanging, pillow or integrated into a larger quilt design. Purchase the Sunflower EPP pattern here. Cover quilt uses Robert Kaufman Manchester in Fog and the full collection of Palm Canyon by Violet Craft for Robert Kaufman Fabrics. English Paper Piecing is a technique where fabric is wrapped around paper templates and secured with basting stitches or glue. The pieces are then sewn together by hand with a tiny whip stitch or ladder stitch. Pillow project uses Robert Kaufman Yarn Dyed Essex in Taupe for the background, Essex Yarn Dyed Expresso for the center and the Kona Solids Creamsicle, Nectarine, Goldfish, and Manchester Poppy for the petals. Binding is Kona Nectarine. Pillow has 3” borders added to finish at 18” square. For the sunflower fabric suggestions, 1/8 yard is not wide enough for the middle of the sunflower. 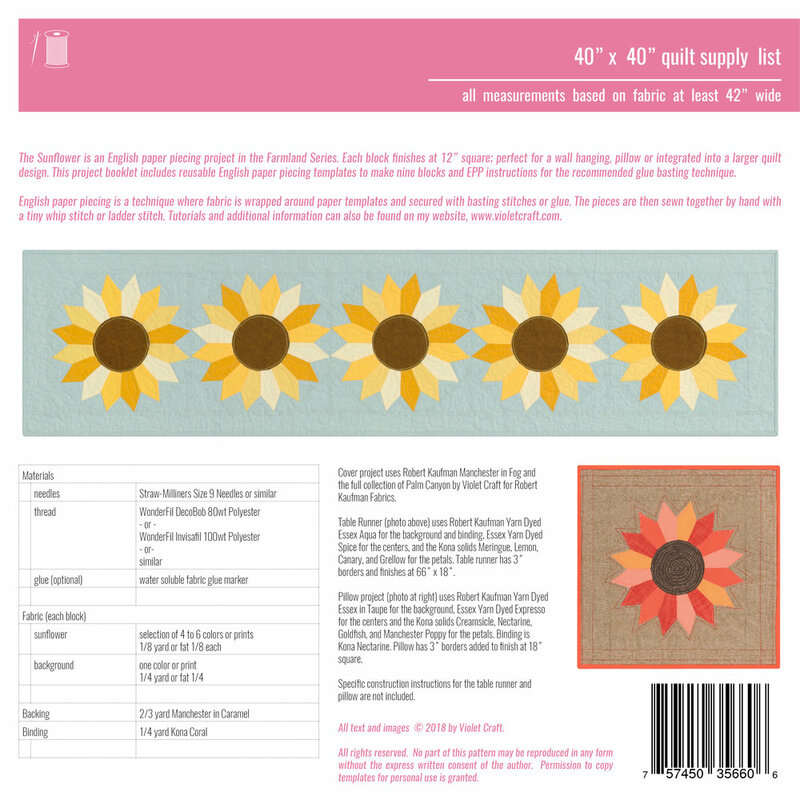 The fabric suggestion for the middle of the sunflower will need to be either a fat 1/8th or larger, such as a fat quarter. The petals of the sunflower can be cut from 1/8 yard cut.